It's no secret that I've a soft spot for the Ducati Multistrada. My 2016 example, more than all of the others, heh heh. 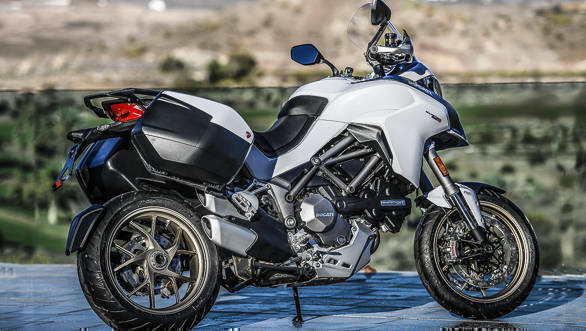 So it was with a fair-sized pit in my stomach that I agreed to attend the press launch of the motorcycle that would make my Multi obsolete - the all-new for 2018 Ducati Multistrada 1260. At this launch, we would only ride the S model. As usual, Ducati India will introduce this motorcycle in India in 2018 and it will be imported fully-built from their Thailand-based assembly plant. 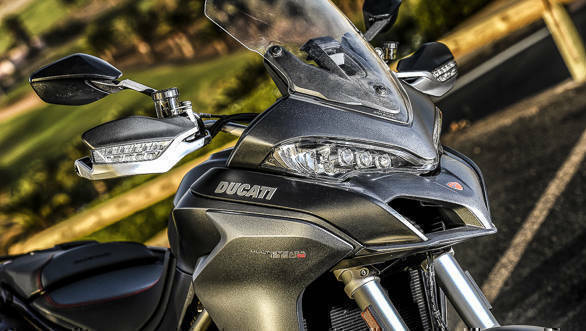 Despite the increased equipment, Ducati has not raised the prices in Europe by any significant amount and we expect that Ducati India will also follow suit. The big change, naturally, is the new engine, the X-Diavel based 1,260cc 90° V-twin. But it's more than just the displacement. Ducati keep the same valve and cam profiles and timing but the engine is recalibrated and that makes a massive difference. So you will hear that the bike makes only 1Nm more than before and power rises by a modest 6PS. But the truth is that they've filled in torque from 3,500rpm onwards and the gains are substantial. That dramatically changes the throttle feel of the Multistrada even though gearing etc all remain exactly the same. Ducati as also now added the Ducati Quick Shifter or DQS which works up and down shifts and is sensitive to lean angle. Ducati doesn't explicitly have an engine brake control menu on the 1260 but even that is metered out depending on the lean angle. This engine is mounted in what adds up to a brand new frame. The trellis itself isn't different but the swingarm is 48mm longer (massive update, that) and that extends the wheelbase. But Ducati has also made the steering 1° slower which adds 5mm to the trail as well. In essence that's a new head stock. The extended new chassis also means that the suspension electronics on the S follow the same logic but has been recalibrated. And in the menus a new tyre calibration menu that makes you ride at a preset speed in first gear so that the electronics can work out how to function best if you change to a new tyre or change tyre profiles or section. The third set of changes is to the human-Multi interface. So the system of long and short presses on the left switch cube set has been reorganised for a more logical operation. 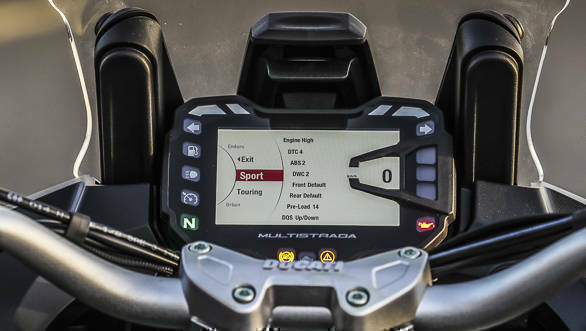 The screen, says Ducati, is the highest res TFT colour display they've ever deployed and the graphics are now clearer, colour-coded by riding mode and easier to see at a glance. Ducati has also added an explanatory graphic for each setting option menu that tells a new rider via a simple performance vs stability sliding scale what the changes they are making - to suspension, or traction control or ABS - mean for the behaviour of the motorcycle. As was the norm last time, the S is a very electronic, very, very adjustable motorcycle and while the initial spread of possibilities feels daunting, most owners learn rapidly on where and what the changes they need to make are. Well, not quite. Ducati see the 2018 model more as a facelift than a full model change despite the sweeping changes. And so the upper fairing is exactly the same as the old one. The new side panels look better integrated and the trellis frame isn't red any more. The seats are new - for better fit-finish and the Enduro supplies the rear 'tray' that goes on to become the smart new grab rail. This, says, Ducati, allows 1200 owners to access the available Ducati Performance (by Touratech) top box that was earlier exclusive to the Enduro and the 950. Ducati will add a new Tyre Pressure Monitoring System to the accessories list, and that brings us to the 300g lighter new wheels. They're cast alloy as before but lighter and the white and grey colours get these dull gold wheels. The Pikes Peak now gets forged alloy wheels and that's a significant performance upgrade. 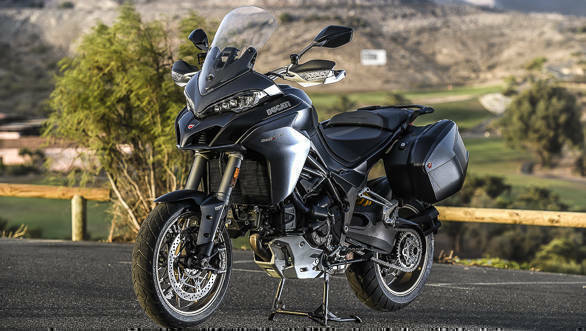 The first thing that blows your mind about the new Multistrada is the overall refinement of the package and to be specific, the engine's comportment. 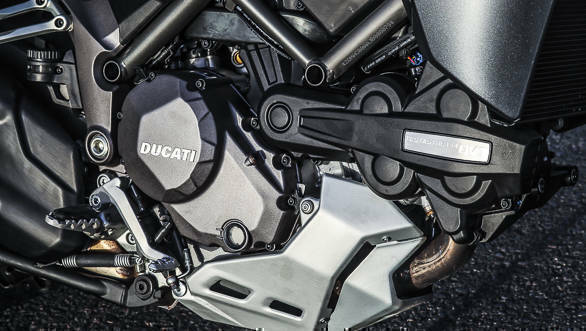 It's refinement, as far as I can tell, is unprecedented for a Ducati twin-cylinder engine. It's smooth, slick and almost entirely vibration free unless you're roaring along near the redline. And this is such a tractable engine too! Anything past 3,500rpm feels like a jumbo jet rotating for take-off. I repeatedly had the front gently wheelies or a crest here and there at mid-revs without provocation, a new experience on the Multi for me. I didn't understand fully what that meant for riding initially. The Gran Canaria roads are endlessly twisty and you spend a lot of time cranking the bike from full lean one way to the other. But then I discovered that when I thought I was in second or third gears, I was actually a full gear higher. That's how torquey the motorcycle feels. Unlike the old one, the 1260 seems less sensitive to gear changes and while the 1200 had a directly sportsbike-like top-end mad-fast feel, the 1260 is more measured and overall, a lot quicker in almost every situation. The quickshifter is gold. I've missed one on the 1200 from the very first ride and the 1260's DQS makes so much sense I cannot believe Ducati don't have an option for the older bike at all. The lean sensitive DQS manages fast, smooth up and downshifts possible anytime you want. On these unknown roads, the number of times I changed up or down at big lean angles should have made me nervous. But ultimately, I stopped worrying and let the system sort out my riding errors. The DQS can be a bit jerky at part-throttle when you change gears but that's considered normal for most quickshifters - they work best at full or no gas. This brilliantly flexible engine goes into a slower steering, stability oriented new frame. Ducati engineers told us that there has been some feedback that the 1200s were too reactive and too sporty and that hampered their abilities when, for example, touring with luggage. Well, sorted. 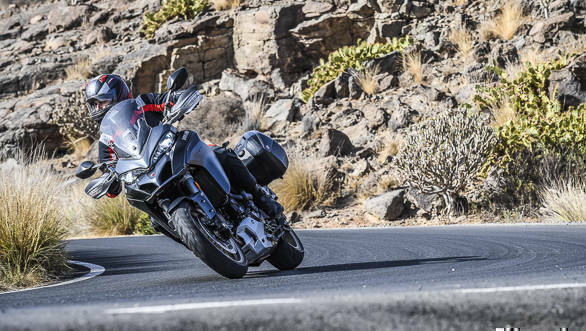 The longer frame and slower steering make for a beautifully stable Multistrada. Whether we faced poor tarmac, potholes, bumpy but good tarmac, or racetrack quality asphalt, the 1260 stayed as planted as an old neem tree. The semi-active Sachs suspension feels more refined in its reactions than before and with rear preload set correctly - one button press to select Rider-Baggage mode on our optional pannier-ed 1260 S - the motorcycle felt aces. I suspect that compared to the old one, adding a pillion or luggage or both to the 1260 will produce minimal change in its sporty but composed manner. This stability does have a flip side, of course. 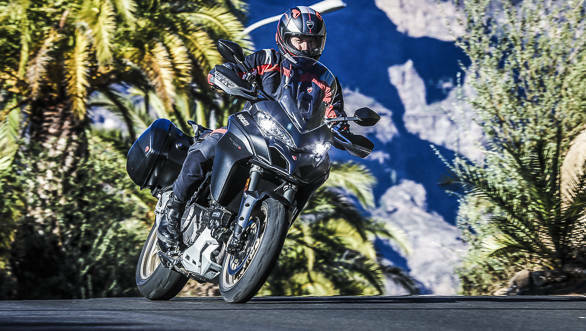 The Multistrada 1260 doesn't turn as rapidly as the old one. Given the engineering brief, this is no surprise, of course. And in most situations, this will not matter. But on the endlessly flick-flacking roads of the Gran Canaria, it felt like I had to hustle the 1260 a fair bit more than the 1200 would required. It's a fine-fine-fine nuance, but the 1260 responds in a more considered manner which will faintly needle skilled riders but make everyone else very, very happy with the safe-predictable feel that it makes for. You cannot close this discussion without doffing your hat to the most excellent Brembo M4.32 brakes and the Pirelli Scorpion Trail II tyres which worked hilariously well on Gran Canaria's fairly variable asphalt. I honestly have had nearly full gas open in places where no thinking rider should. But the invisible but ultra-effective IMU-electronics and the tyres work startlingly well. So what's the score? Ducati has nailed the brief. 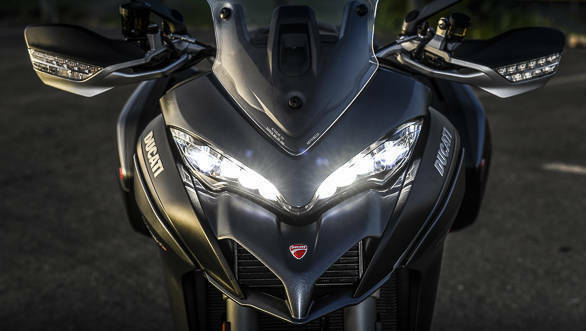 They wanted to evolve the Multistrada to be even more versatile, still more appealing and that's what they've done. The engine is breathtakingly flexible and it's matched by a frame and suspension that support riding as fast as you can handle but without the nervous-frantic energy that made the 1200 feel so devastatingly, addictively edgy. The 1200 was a huge, controlled explosion. This one is a gigantic blow torch. It's frighteningly fast but its calm and that means you have more time to, erm, aim it. This also means that riders looking for that explosive zing that made the 1200 so addictive will find the 1260 a bit mild-mannered. Yes, I do realise I'm calling a 160PS motorcycle the size of a small house with insanely huge capability mild. It's a strange world. Ducati will introduce three of the four 1260 models in India. The D|Air is the only model we won't get - Ducati only sells those in Europe, essentially an S with a fork-based sensor that triggers an jacket-based airbag. The base 1200 will be the cheap one with normal headlights and manually adjustable Sachs suspension. The Pikes Peak will get forged wheels, manually adjustable Ohlins suspension and a forest of carbon fibre parts to remain the sportiest, lightest flagship of the range. 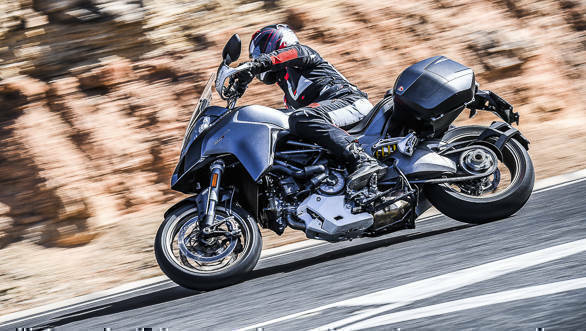 Ducati says the 2018 Pikes Peak will increase in price difference from the S, though. The S, as usual, will be the heavily-loaded electronicky best seller of the range.